Battery : Integrated into the Real Time Clock (RTC)--Dallas® DS12887 chip. The internal battery in the DS12887 device has an estimated lifetime of ten years. 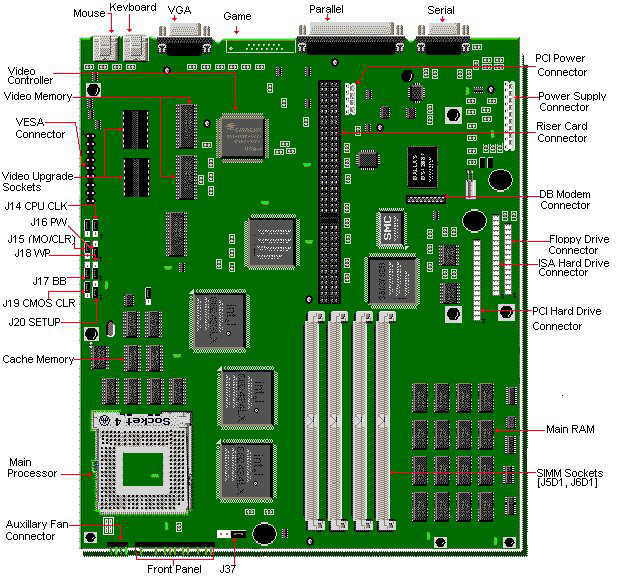 Bus Architecture : PCI 2.0/ISA based system bus. Intel Mercury PCI Chipset. 66MHz maximum bus speed. Cache : 16K level 1 cache. 256k level 2 cache. PCI0640B PCI to IDE Controller. CPU : Type 4 CPU Zero Insertion Force (ZIF) CPU Socket. RAM : 8MB standard/136MB maximum. Uses 4/8/16/32MB 72-pin SIMMs, @ 70ns. Video : RAM upgradable to 2 MB. The battery is a Dallas DS 12887 real time clock and CMOS battery integrated into the RTC chip. This chip is soldered onto the motherboard and is not replaceable. The BIOS in the PB520 is contained in Flash EEPROM, and it can be updated via software. If the Flash BIOS is corrupted during an update, it is possible to recover it. 9. Press the Down Arrow key to select 1009bc0r.bi0 file. 2. Remove the system's case and move the jumper block on J17 from pins 2-3 to pins 1-2. 7. Move the jumper block on J17 from pins 1-2 back to pins 2-3. The motherboard comes with 16KB of cache integrated in the processor ( CPU ). A secondary external cache level (write-back cache ) of 256KB is soldered on the motherboard. This cannot be upgraded. Intel Pentium Overdrive Processor (P5T) 120 MHz. The upgrade processor installs in the Zero Insertion Force (ZIF) socket location U2B1. Jumpers do not need to be changed. This motherboard does not accept EDO memory. SIMM speed must be 60 or 70ns. Use silver plated SIMMS (Do not use gold plated SIMMS). The motherboard of this system comes in two different revisions. One contains 2 SIMM sockets (can max. be upgraded to 72MB), the other one contains 4 SIMM sockets (can max. be upgraded to 136MB). Upgrade in pairs. This means you have to fill a bank completely. E.g. when upgrading the system with 16MB, you have to use two 8MB SIMMS instead of one 16MB. This system already has 8MB of RAM memory soldered onto the motherboard, regardless the number of SIMM sockets. The video memory on this system can be upgraded to 2MB, by using two 256Kx16-70ns SOJ DRAM chips.